When a boy becomes a tool for an evil mage, his brother must fight them both. 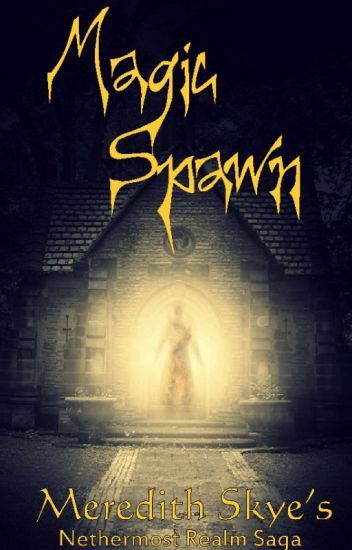 A ten year old boy stumbles into a cemetery crypt to waken an ancient magic on Halloween night. The small town must defend themselves from the undead horrors brought upon them by a dark mage from another plane of existence. Then they learn a terrible secret--the boy is not of this world! He is a magic-spawn! If the necromancer captures him, then the results will be catastrophic for both their worlds. This work is an editing draft, so please give me feedback as to the details and pacing of the story. This will be appreciated! NOTE: A self-contained urban fantasy novel. This story  tells about the origins of characters from the series:  Nethermost Realm,  which is also up on Wattpad. Both can be read separately. Desperate to save his brother's imminent destruction by the Arlunni Guardians, Rian did the unthinkable-he took his brother as a magic-spawn. But this unlocked deep, dark secrets buried in the magic-spawn's mind, and threatened to unhinge Rian's mind. As his mind merged with Kyran's and with the leftover memories of Molan, he forgot who he was. And the Arlunni banished him-to the Nethermost Realm! Note: Magic Spawn Origins is a prequel to the Nethermost Realm series. Where we meet Rian and Kyran for the first time. Magic pieces of armor rain from Lenova's skies, granting men God-like powers. Mountains move, lightning bends to command, and a man's future can be written in a book before it has even happened. -And an ancient artifact with a hibernating power has grafted itself to Finn's arm, marking him a "Star-Child". Poor Finn has never experienced what free life has to offer (he doesn't even know what milk is) and now has ended up getting a lot more than he bargained for. -From flaming coal-coated vat-worms and two-directional streams to floating cities and underground pyramids, follow a fantasy journey of epic proportions! The virtual reality gaming was a godsend for Jonathan Carter. He would be able to escape from his miserable existence, at least for a while and be someone else. No one would know him, only his avatar. He would get to kill orcs and the best part was, he was getting paid for it. Troy's not-at-all interesting life took a different turn last summer when it was revealed that he came from a long line of wizards. His last experience in the Magic school was filled with a lot of magic, friendship, craziness and other experiences he would give anything to forget. Another summer has arrived and Troy returns to Firewalt only to find an unpleasant surprise waiting for him; He has an halfbrother. A rivalry ensued between them with Troy having the most to loose. After a very powerful enemy from the past threatened to destroy the very existence of the world of magic, the two had to team up in order to stop him. Will he succeed or will the halfwizard in him be their ultimate downfall? Book 2 in the 'Troy Sanders' trilogy. P.S: Remember to vote, comment and share with your friends. There is a legend about children that are born with red hair. They will either die in their childhood, or grow up to become a powerful mage that will cause chaos among the clans. Either way, children are told growing up, beware of the children born with red hair, for they will hurt you without a care. A murder mystery set in a school for wizards. When apprentice wizard Adramal moves to a new school to complete her training, she discovers that several ritual murders have been committed by magic, threatening the fabric of the world. The evidence points to the killer being one of Adramal's teachers, and the City Watch recruit her to go undercover to unmask the murderer. Can she find what she needs before the killer strikes again or - worse - without blowing her cover and putting her own life in danger? This book was one of four finalists in the May 2015 #Wattpad4 contest. The judges said, "I was pulled into the story from the start. It delivers what it says with a strong premise and threat-filled plot." Three further books in the series, Plague & Poison, Dust & Water, and Stone & Silence, are on sale. The whole series is available in ebook, paperback and audiobook, read by the author. Search for "Steven J Pemberton" on Amazon, Apple, Audible or Barnes & Noble, or visit http://www.pembers.net/books.html for other retailers. The story starts with an angel that disobeyed God's order, then planned to kill God and replace him and take all over the other realms, worlds and universe, But there are 5 Kings from different realms that decided to make an alliance to stop him from his goal, and to do that they need to make a weapon that can even slay a God. And oh, I'll be adding some pictures I got from the internet, it's kinda all mixed up, but it's all up to you if you want to look at it or imagine your own characters. Within a week, Katherine must face reality; she is the Ultimate Power. There is no denying her heritage, and she must learn to accept her fate. As the country of Beovore's future remains in her hands,  Katherine enters a new, strange world she was never prepared for. Meanwhile an army of Warlocks are headed in her direction as Katherine fights internal conflicts of her own. There, a revolution will rise. There, in Alderless, a war will start. And Katherine will be in the middle of it all. Enter the world of the Magical Kingdom with the Forbidden Forces at your side. Months ago, Kyra saved her realm from a very powerful force of evil and ended the great conflict between the humans and wizards, but peace hasn't returned like she had hoped. Even worse is the fact that although the wizards proclaim her as their Saviour, they refuse to accept her as their leader, the greatest of her opposition being in the form of an ever mysterious coven. But with the support of her own people dwindling every day, will she be able to overcome the growing darkness of magic?